T-KIT Switchmatic is an electronic pressure switch integrated in a 3-ways fitting with a digital pressure gauge. T-KIT Switchmatic is an electronic pressure switch integrated in a 3-ways fitting with a digital pressure gauge. It can manage the start and stop of single-phase electric pumps up to 3 HP (2,2 kW). Cut-in and cut-out pressure implementation can be set easily and accurately through a users friendly control panel. Wiring is carried out identically to a conventional electromechanical switch. 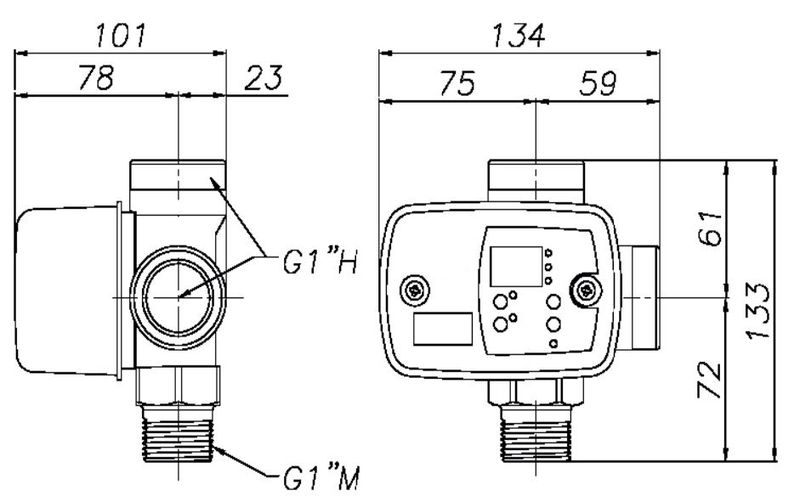 It can operate as a differential pressure switch and as an inverted pressure switch. There is an internal non-return valve. T-KIT Switchmatic 2 includes also instantaneous current lecture. This patented version controls and manages the overcurrent, the dry-running protection of the pump and fast cycling protection. Electronic pressure switch integrated in a 3 ways fitting. Sleep mode with low power consumption. Integrated pressure gauge with bar and psi instantaneous display. User friendly control panel with 3-digits display, led-lights and pushbuttons. Dry-running protection by current (for type T-KIT Switchmatic 2) and for minimal pressure (for type T-KIT Switchmatic 1). ART function (Automatic Reset Test). If the device has been stoped due the action of the safety system against dry operation, the ART tries to connect the pump, with a programmed periodicity because the water supply could have been restored. Overload protection (only type T-KIT Switchmatic 2). Rapid-cycle alarm: when the hydropneumatic tank has lost the air and frequent start-stops are produced an alarm is activated and is delayed the start. Operation modes: differential, inversed differential and synchronized (only for T-KIT Switchmatic 2). Advanced MENU with complementary settings. EMC certified and Electrical Safety certifed. - Set mode: Cut in and cut out pressure. - Operating mode: Bright bar or psi. - Pump on: Flashing bar or psi. - Bright: displayed Pressure start or Pressure stop. Push Buttons Up and down: Increase or dicrease configuration parameters.